Metrocity, opened on April 30, 2003, is a modern shopping mall in the finance and business quarter of 1. 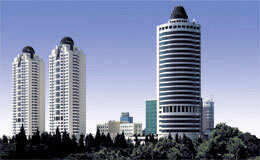 Levent in Istanbul, Turkey, with a direct connection to 1. Levent subway station. The unique architectural concept of the shopping center’s roof covering made out of Teflon coated fiberglass fabric, first application of this size ever used over a shopping mall, gives the visitors the feeling of shopping under the daylight. Easy access within the complex is provided by 3 panoramic, 5 elevators and 36 escalators.